In addition, from the mid-1930s on, the allegations of conspiracy and wrecking were increasingly used by the regime to explain the difficulties that accompanied the implementation of the industrialization plans. Although the targets of the Second Five-Year Plan were more realistic than the initial reckless onslaught of the first plan, chronic problems of delays and bottlenecks persisted. Soviet leadership interpreted them as resistance to “the party line” designed to derail industrialization, and it threatened administrators in the localities with reprisals. Not unnaturally, local bosses did their best to unmask as many “saboteurs” and “enemies of the people” as they could, scapegoating thousands of innocent people for the failures of the system of centralized planning and for their own mismanagement. In 1937–38 terror reached a pathological level, extending to all social classes, and various professional and ethnic groups. This peak of mass repression is associated with the name of Yezhov, head of the NKVD (People’s Commissar for the Interior) at the time. 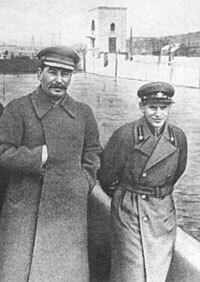 Later Stalin would scapegoat Yezhov, blaming him for the “excesses” of the campaign of the “exposure of the enemies of the people” and branding his methods as “Yezhovshchina.” In reality, Yezhov acted merely as a zealous executor of the directives issued by Stalin and his inner circle. In 1937 over 900,000 people were arrested and in 1938, more than 600,000. The overwhelming majority of them—almost 90 percent—were political prisoners arrested on charges of counterrevolutionary activity. Almost 700,000 death sentences for “counterrevolutionary crimes” were served during those two tragic years. It is highly significant that the surge of mass terror in the form of “Yezhovshchina” coincided with the triumphal official statements to the effect that the country had entered full-blown socialism. The blatant discrepancies between the official promises and the realities of life in “victorious socialism” caused mounting frustration and disaffection. In these conditions, the regime sought to shift the blame for persistent difficulties at work and at home on the machinations of “enemies of the people”: administrators and specialists who had allegedly betrayed the cause of socialism. In this sense, “Yezhovshchina” had an antibureaucratic and populist aspect and served to vent the pent-up frustration of the credulous masses. Stalinism, with “Yezhovshchina” as one of its hallmarks, also had deep roots in postrevolutionary Soviet history. Many of the important ingredients of the Stalinist system are detectable in the early Bolshevik regime as it evolved under Lenin, including the Communist Party’s power monopoly, the destruction of all political opposition, the elevation of terror into an instrument of state, ideological indoctrination, and growing ideological dogmatism and intolerance. Stalin transformed these seeds into his own brand of extreme authoritarianism based on the party’s central role in the political system and the state monopoly over productive property. He established an ideological dictatorship, propped by mass terror, the leader’s cult, and the invoking of the enemy image. In doing all this, he amplified the authoritarian features of Leninism by taking them to an extreme. PREVIOUS GO TO "USSR IN WORLD WAR II"